Most buyers are focused on finding the right house. They’re more concerned about finding the right home with the private backyard, updated kitchen, and roomy master suite. When you’re house hunting, it can be easy to forget about the importance of finding the right home in the right neighborhood. 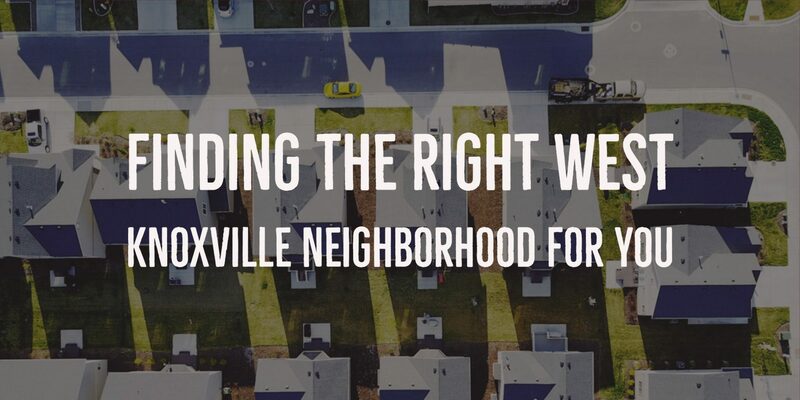 Finding the right West Knoxville neighborhood matters more than you may think. Your home may be the perfect oasis, but if it’s located in a place that makes you unhappy, you won’t be happy in your dream home. In this post, we’ll offer some advice to help you find the right West Knoxville neighborhood for you. West Knoxville enjoys a wealth of different types of neighborhoods. Do you want maintenance-free living? Do you want to live on the water? Do you want a community that has a neighborhood pool and clubhouse? Or, do you want to be able to walk to restaurants and shopping? Determining the right type of neighborhood for you should be an important item on your home search. Just as it may be important to have a certain square footage or updated kitchen, the neighborhood matters just as much since it’s something you can’t change. You can change the cosmetics of a home by repainting or replacing flooring, but you cannot change a neighborhood. Figure out what matters for you in a neighborhood and keep it as an important item on your home search checklist. You’ll want to like the home and the neighborhood. Visiting a West Knoxville neighborhood is a great way to figure out if it is the right fit for you. You may do this at different times during your home search. You may do it at the very beginning when you’re trying to figure out where you want to search for homes or you may do it during your actual home search. Take the time to drive through the neighborhood and really get a feel for if it’s a good fit for you. It can be wise to do it at different times of day to truly get a feel for what it’s like. If you’re visiting a home during the week in the middle of the day, it’s likely that a neighborhood will be pretty empty since kids will be at school and people will be working. Consider driving through during a time where more people are likely to be out and about to truly get a feel for what the neighborhood is like. There’s much more to researching a West Knoxville neighborhood than just viewing the neighborhood. You’ll also want to learn more about the area so that you’re an informed buyer. Two big things to look into are safety and schools. Schools matter even if you don’t have school-aged children. Neighborhoods with strong school systems tend to have better resale value and help keep home prices stable since people will always want to live in a strong school system. Do a bit of research into the surrounding school systems before settling on a neighborhood. If you’re new or unfamiliar with an area, it can also be helpful to look at a neighborhood’s safety. Websites like CrimeReports can help you have an idea of the safety in a neighborhood.